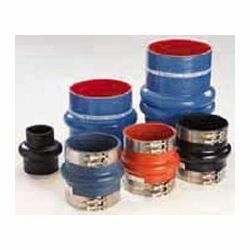 Rubber Hump Hose Bellows provide the ultimate flexible connectors for Marine Wet Exhaust Systems. They offer much greater tolerance to heat , misalignment, engine movement, & vibration, with significant savings in cost, parts, labor and space. Highest max. continuous operating temps. Trident 90° Hi-Temp Molded Rubber Wet Exhaust Elbow - 5"
Trident 45° Hi-Temp Molded Rubber Wet Exhaust Elbow - 5"